Escape to the lap of luxury when you book your stay in Hatteras Dream. This exclusive oceanfront home in the Tarheel Shores neighborhood has everything you need for a carefree retreat. With ground-level elevator access and a roll-in shower on the middle level, Hatteras Dream is the perfect place for those with limited mobility. From the large, fenced-in yard ideal for dogs, to the five spacious shaded decks, to the 8 master bedrooms each with their own TV and tiled showers, this grand getaway offers plenty of elbowroom for your extended family. Dry entry to the ground level makes move-in a breeze. Family fun is afoot in the game room with pool table, shuffleboard, TV, and comfortable sitting area. A wet bar kitchenette with full refrigerator, dishwasher, commercial ice maker, and microwave is perfect for pool treats and movie snacks. Watch the big game, your favorite show, or the latest action flick on the giant projector screen in the theater room, while the kids enjoy their own entertainment in the miniature theater room. Both theater rooms open onto a shaded deck facing the driveway. 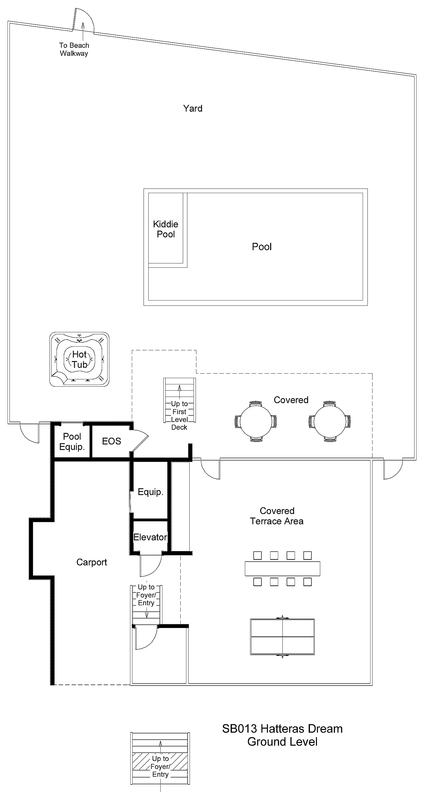 Two king bedrooms, one with access to the shaded pool-view deck, are on this level, along with a convenient half bathroom. Four bedrooms are on the middle level, along with the laundry area featuring dual washers and dryers. Three are kings, two opening to the shaded oceanview deck. A den with queen sleeper sofa and private bathroom with tiled shower also opens onto the oceanview deck. Across the hall, a large bedroom is divided into two sleeping areas, each with two pyramid bunks and a TV. This space, perfect for giving the kids their own hangout spot, features a private bathroom with tub-shower combo as well as a private shaded deck with distant sound views. A half bathroom is conveniently located on the landing between the second and third levels. 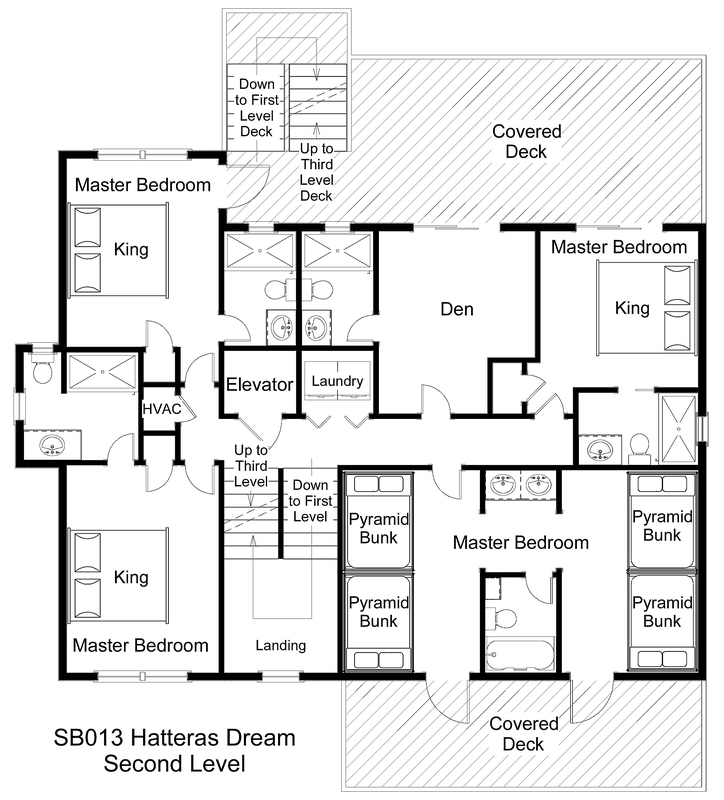 Two king bedrooms are on the top level, one with access to the shaded oceanview deck. Spend some quality time together in the open living, dining, and kitchen area, featuring awe-inspiring ocean-to-sound views. The chef in your group will feel right at home in the upscale kitchen, complete with dual wall ovens, two dishwashers, and 5-burner glass-top range. A second full-size refrigerator and additional microwave at the wet bar make storage and meal prep a cinch. Take your pick of dining options, from the large main table, to the cozy breakfast nook, to the breakfast bar and additional bar-height seating in the living area. Gaze over the ocean from the living area or cozy up in front of the gas fireplace on cooler evenings. Take in the breeze and the sunrise from the shaded oceanview deck as you plan your day’s adventures. The outside of this home is nearly as opulent as the interior. A covered terrace area with bar seating and ping pong table features a stereo hookup for connecting your device to the outside speakers. Just inside the pool fence, enjoy covered seating as you dine al fresco on meals prepared on the dual gas grills. Take a dip in the refreshing 15x30 in-ground pool with available pool heat and attached kiddie pool or soak your cares away in the hot tub. The fenced-in grassy yard is perfect for lawn games or just letting the kids and pups enjoy the great outdoors. When you’re ready to hit the beach, take the shared wooden walkway over the dune to relax and enjoy the surf and the sand at the beach, where cabana service is provided during specified dates. If you can pull yourself away from this lavish retreat, restaurants, shops, and equipment rentals are just a short drive or bike ride away. 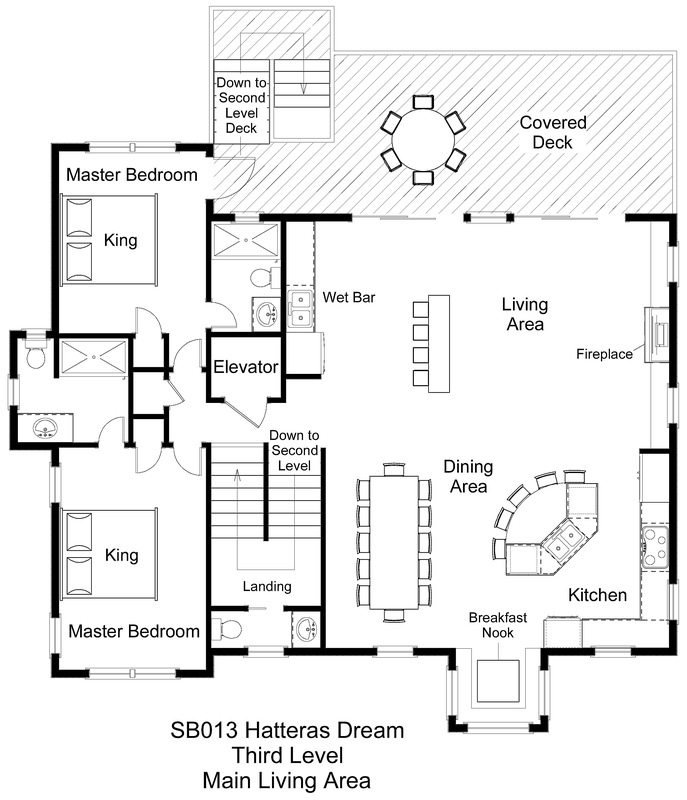 You’ll be living the dream at Hatteras Dream. Where can I find vacation home prices for various dates? On the homepage you can choose the arrival date among other filters and a variety of homes will populate by availability. Those homes can be sorted by price as well. On individual property pages you can choose the arrival date and click "check rates" and the price will come up. Is the pool heat available in March and April? Hi. On the website, it says that homes cannot be used for receptions/events unless agreed upon in writing at the time of reservation. How do I make a request for this? You would need to call the office and contact a property manager directly. It's available May 18 - Sept 28, 2019, set up at 10 am and removed by 5 pm each day of your stay (excluding check in and check out days) except during inclement weather. Great home for a large family. If this house is available, rent it. You will not regret it. Nicely designed, spacious, new build. 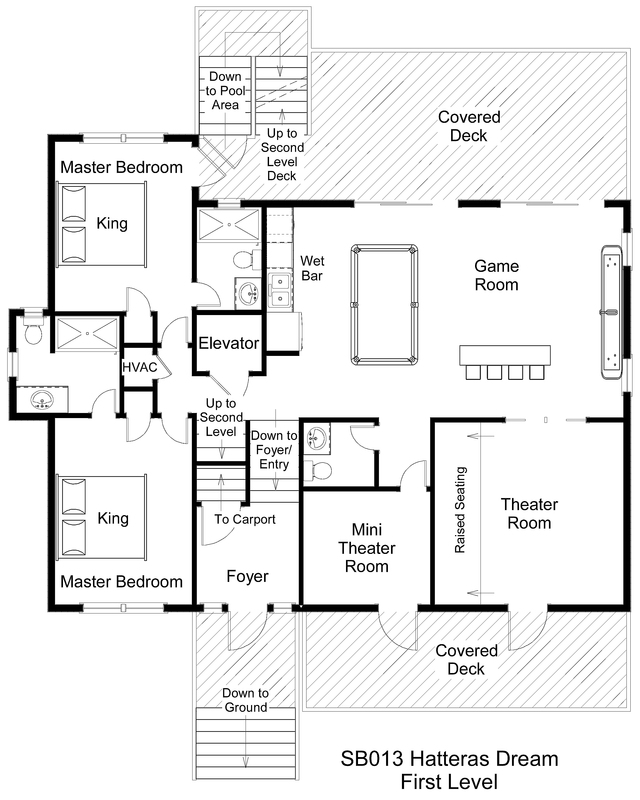 All bedrooms are masters as stated. Nice family pool. Great back yard. Easy walk to the beach. Good AV equipment but technically challenging at times. Cabana service is a big plus.